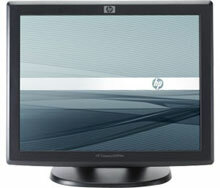 HP L5009tm - 15" Promo Touch Monitor with acoustic pulse recognition technology. The HP Compaq L5009tm monitor's pure glass screen provides high durability and is a damage-resistant alternative to film-coated display screens - it even continues working when wet or scratched. New Acoustic Pulse Recognition (APR (Acoustic Pulse Recognition) touch technology) technology recognizes a wider array of sounds created when the glass is touched at a given position. Use a pen, credit card or fingernail to quickly and accurately tap from screen to screen. The HP Compaq L5009tm monitor also comes with a limited three years parts, labor, and on-site service warranty. The HP VK202A8#ABA is also known as Hewlett-Packard	HPA-L5009TM	or VK202A8ABA	.